Texas Hold'em is poker's most commonly played variant, but the distinction between limit and no-limit creates what amounts to different games altogether. The high-variance and volatility of no-limit hold'em diverges in nearly every way from the limit variety, which prioritizes position and the extraction of thin value above all else. Excelling at one format or another is something most poker players can accomplish quite easily, but mastering both requires a certain level of adaptability. 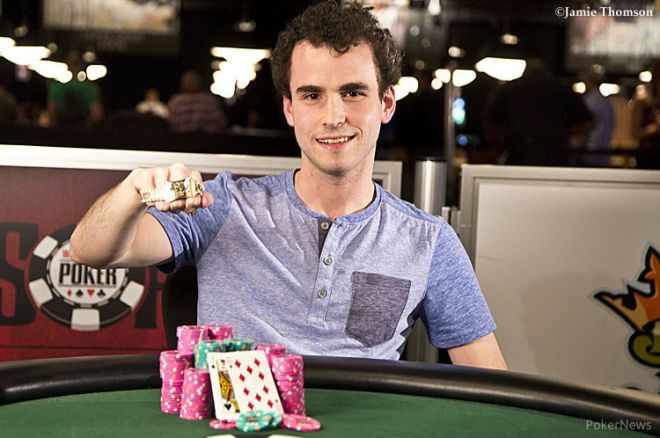 All of which is to say Dan Kelly's second World Series of Poker bracelet was something special, as he added the Event #43: $1,500 Limit Hold'em title to the $25,000 No Limit Hold'em - Six Handed crown he claimed five summers ago. Every poker player dreams of winning a bracelet, and each year dozens of hopefuls make that dream come true, but breaking through on the WSOP stage a second time separates the one-hit wonders from the wizards. If At First You Don't Succeed...: Last year Kelly turned in one of the most consistent performances in WSOP history, recording nine cashes to nearly match Konstantin Puchkov's 2012 record of 11 cashes in a single summer. And Kelly did much more than merely min-cash his way through the series, as he finished in the top-20 an astounding eight out of nine times he made the money. With two final table runs sprinkled into the mix, Kelly's romp through the rough and tumble world of tournament poker was remarkable in many ways, but he ultimately failed to parlay the positive momentum into a first place finish. Kelly final tabled the $5,000 No-Limit Hold'em (Eight Handed) event but fell in sixth place to get his series started, and just days later he made it to the Mothership stage for a second time, where he placed fifth in the very first $1,500 "Millionaire Maker" No-Limit Hold'em event. "It feels better [than last year]... it's always nice to win," Kelly observed after holding up his second career bracelet for the cameras. "It's frustrating getting fifth and sixth. Probably hard to top the first one, because that was my first World Series, but this one's still pretty cool. It's really tough to win." Parental Supervision: Throughout the final table it became clear that Kelly had a pair of fans on hand that stood out from the rest of his rowdy railbirds. As it turned out, his parents David and Kathleen had made a well-timed visit to Vegas, and one week removed from Father's Day, Dan did his best to win one for Dad. "It's great," said David moments after watching his son climb poker's pinnacle. "It's the first time we've seen him play live, other than on streaming. We had a weekend vacation planned, and he was good enough to get to the final table for us the one weekend we came." Repeat Offenders: After Robert Mizrachi cashed in for his second career bracelet in the Dealer's Choice event on Saturday, the list of two-time winners this summer inched closer to the record of 20, as Kelly's double dip made it 16 total through 43 completed events. While the addition of European and Asia/Pacific stops the WSOP schedule in recent years has muddies the waters in terms of all-time bracelet records, the standard for a summer series in Sin City is 20 repeat winners, and Kelly's second trip to the winner's circle brings 2014 that much closer to a slice of history. You Never Forget Your First: Although Kelly has 27 cashes to his credit in WSOP competition, with those in-the-money finishes spanning the spectrum of poker disciplines, this was his first recorded live cash in a limit hold'em tournament — ever. Of his 48 total career cashes in live events, none had come in limit hold'em until Sunday's bracelet win. The Trifecta: Brandon Shack-Harris continued crushing at the WSOP, reaching his third final table in as many weeks. Shack-Harris snagged his first career bracelet back in May, winning Event #3: $1,000 Pot-Limit Omaha for a $205,634 score. Soon afterward Shack-Harris made good on his promise to perform well in his preferred variant, nearly making it back-to-back bracelets in Event #18: $10,000 Seven-Card Razz Championship, where he ultimately finished as the runner-up to George Danzer while adding another $182,155 to his series earnings. Sunday saw Shack-Harris put himself in contention for a title once more, but he had to settle for a still impressive 1-2-3 result. Lisandro Gets His Redback: Jeffrey Lisandro has quietly (or not so quietly... just ask Brandon Cantu) become one of the most consistent performers in WSOP history, and on Sunday he added his 55th career cash at the series to an already sterling résumé. In 2009 the Australian native earned WSOP Player of the Year honors by virtue of winning three bracelets in three weeks. A few days ago he made the final table of Event #38: $10,000 Seven-Card Stud Hi-Low Championship before falling in fifth place, and he made it an even 20 final table appearances at the WSOP with his seventh place run on Sunday.